Whether or not your business offers products or services to other businesses or to consumers, social media offers a terrific opportunity to extend your reach to a much larger target market. After all, just because you have a website doesn’t mean folks are beating down your door to get in! This is where social media fits into the big picture: You may already have a website ‘storefront’ close to, or far from, the center of the action. If your website has minimal page views and visitors, it may seem like you’ve set up shop on the outskirts of town where there’s little foot traffic to view and buy your wares. Here’s your opportunity to be seen where all the action is: in social media. One of the things we do differently at Cornucopia Creations for our social media clients is map out a comprehensive strategy. A common mistake made by businesses on social media sites is lack of planning. And since success is a direct result of careful planning, we ensure our clients are clear on the goals of their social media engagement and how we set out to achieve it. Have something to measure success against to see how well we progress over time. What does this strategy look like? 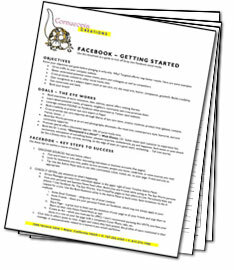 What are some of the goals and objectives you might have for your social media presence? We’ll get to that in a moment, as we thought you’d like to know more about what we offer first. 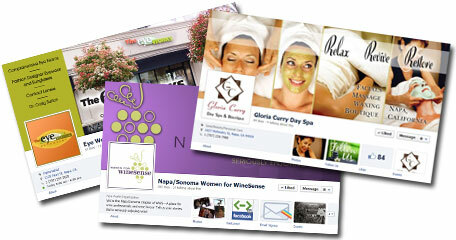 We offer a variety of social media services to best suit our clients’ needs. One option is individual coaching and training if you prefer to do all your own posting to Facebook, Twitter and other platforms. We offer hourly training customized to meet your skill level and business goals on each platform. Meet once a week or once a month, depending upon your needs and budget. If managing your own social media accounts on a day-to-day basis doesn’t fit into your schedule, a second option we offer is complete management of your sites, working closely with you to ensure we accurately represent your brand. If you’ve been searching for the right solution for your business and are struggling to determine what may generate the best results, give us a call to discuss your needs and which service may be most appropriate for you. Are you struggling to understand how one post per day for a month adds up to more than 10 hours of service? Remember that success in any marketing medium requires extensive research and planning before execution. Thus, we start with reviewing your goals and objectives. Next, we must see how those goals align with the needs and wants of your customers and prospects (shown in the worksheets up top and at left). A strategy is constructed from the gathered data before the first Status Update is posted! 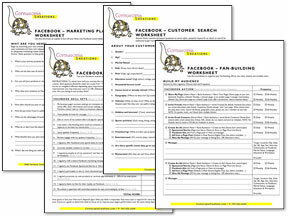 These preparatory actions are essential to building the most active and engaged set of fans for your business. And as we progress each day with finding new fans and reviewing the results of each post, that strategy may be tweaked to maximize your results. In the end, posting one update per day becomes a very modest portion of maximizing our efforts to obtain the best results in fan-building and engagement. We’ll also build your fan page and cover art for you if you’re just launching your presence on this platform. (Some services may incur additional fees for more elaborate artwork or programming. If this is recommended, we will explain the scope of work and these fees in advance.) We’ll also advise you on the best custom tabs to include for your particular business, from events to product promotion or sales pages. Goals and Objectives? Can’t I Just Post My Product Deals? Um, no. Have you ever gone to a cocktail party or business mixer and been cornered by someone who talks only about themselves? Not exactly the type of stellar conversation you like to enjoy, is it? Social media isn’t any different. Your goal – anyone’s goal – is to be so interesting and compelling that folks flock to hear everything you have to say. Most folks will tell you this isn’t a natural talent but one they’ve cultivated over time to become natural and easy. One of your goals in social media, not unlike those business mixers, is to obtain a few solid leads or referrals. Merely pressing business cards into others’ hands doesn’t do the trick. And the same is true on Facebook or Twitter. Better understand potential online clients, peers and colleagues as well as competitors. Cross promote content to other social media sites. Gain recognition as a subject expert (such as eye care, art, the visual arts, humor, compassion, goodwill). Builds credibility. 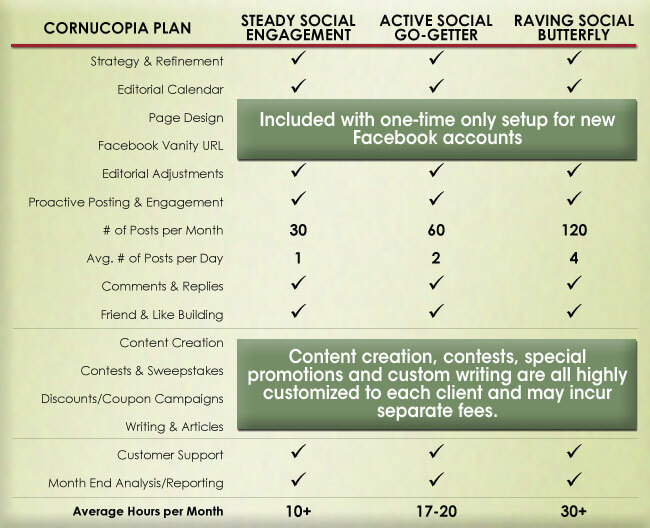 If achieving these goals and objectives are a top priority to you, give us a call today at 707.721.1095 to learn how Cornucopia Creations can help you accomplish them with social media.